One of my most favorite gifts to give someone is fruit. Why? I think it’s a delicious, healthy alternative to chocolate!! Fruit baskets, especially those arranged in an adorable affair are so sweet, nutritious and eye catching. 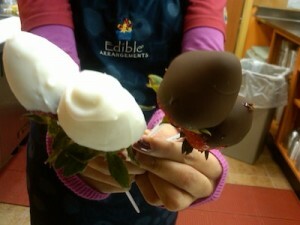 This is why I was thrilled to learn that my friend opened up an Edible Arrangements on 56th Street in NY. 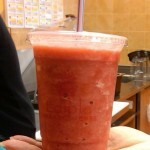 What’s even better about this particular Edible Arrangements is you don’t need to go in there to get your wonderful fruit arrangements, but you can stop on by for a delicious fresh fruit smoothie. These smoothies are extra special because they aren’t sweetened with sugar, but instead with the low glycemic index of all natural agave! This is seriously cool. The other day I stopped in and bought a crustless banana cream pie. 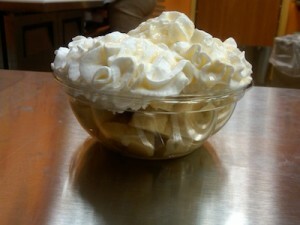 Think about it: freshly sliced bananas topped with whipped cream, white chocolate sauce and shredded coconut. This was so enticing that I asked the sweet lady behind the counter to forget putting the lid on it — I was ready to devour right then and there and that is exactly what I did! As you can see this wonderful franchise is loaded with so many healthy options. Whether you’re looking for a refreshing smoothie on a hot summer’s day or some fruit to go with your breakfast or lunch, or even some chocolate covered strawberries to bring to a dinner party, Edible Arrangements on has it all! Stop by for all the great things offered! This entry was posted on Wednesday, April 13th, 2011 at 10:43 am and is filed under Food, Tasting the World in NYC. That all sounds so incredibly yummy!